Do you celebrate things at your house? We try to. Things big and little — holidays, meeting/reaching goals from potty training to degrees being earned. We celebrate values and goals all things physical, spiritual and emotional. It’s a fun way to turn your heart to thanksgiving. I don’t know about you, but I often remember the bad, hard and negative, but I really have to work at celebrating and marking the good. 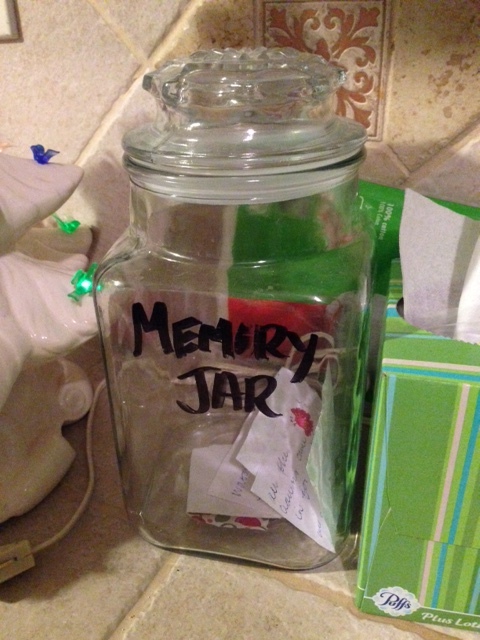 Last year we implemented a “Memory Jar”. For us, it’s as simple as you see here. I found the idea on Pinterest last year. As things happen, I jot them down on a sheet of paper and throw it in there. At church this week talked about how good it is to celebrate; you can take a quick listen here. I’d love to hear how and what you celebrate on a regular (or not so regular) basis!